Fun Bible games for preschoolers are a great way to introduce them to the Bible. "Which Food is In the Bible?" will teach your children about some of the different kinds of foods mentioned in the Bible. I love coming up with fun Bible games for preschoolers to show them that God's Word is full of wonderful stories about real people - just like them. The people in the Bible worked and played and slept and ate just like them. 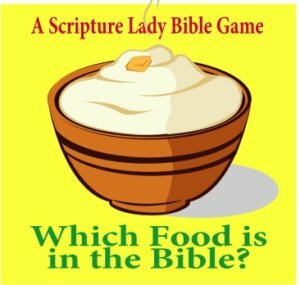 Here is a fun little Bible game to help your little ones hear some great Bible verses that might contain some of their favorite foods. Riddle: This is a fruit that grows on trees in different colors like red and green. "Strengthen me with raisins, refresh me with apples..."
Riddle: This is a fruit that grows on vines with yummy little balls of flavor. "Do not go over your vineyard a second time or pick up the grapes that have fallen. Leave them for the poor and the foreigner. I am the Lord your God." 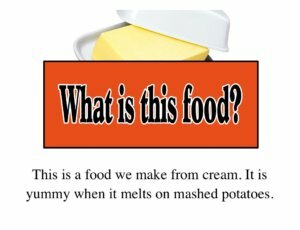 Riddle: This is a food we make from cream. It is yummy when it melts on mashed potatoes. "For as churning cream produces butter...so stirring up anger produces strife." Riddle: This is a food that is good to make sandwiches with. "Then (David) gave a loaf of bread, ...to each person in the whole crowd of Israelites, both men and women. And all the people went to their homes." Riddle: This is a meat we get from the oceans and rivers and lakes. "Then (Jesus) took the seven loaves and the fish, and when he had given thanks, he broke them and gave them to the disciples, and they in turn to the people." Riddle: This is a vegetable that is yellow and grows on talk stalks. "At that time Jesus went through the cornfields on the Sabbath. His disciples were hungry and began to pick some ears of corn and eat them." I created all my pictures on a Power Point. Using a Power Point is a great way to engage your children. Show the first picture that is partially hidden and read the riddle. Have the children guess what the food is. Let a child find the picture with the food fully showing. After the child finds the picture, read the Bible verse. After each turn, say, "(Apples) are in the Bible. God made (apples)." That's it! This will take some preparation but Bible games for preschoolers are always worth the effort to share God's Word.